One of the most common call outs we get as emergency Brisbane electricians is because someone’s RCD (Residual Current Device), otherwise known as a safety switch has tripped or is repeatedly tripping. Often people don’t really understand what a safety switch does and why it’s important for electrical protection. So in this blog post, I’ll explain what it is, the different types available and the importance of effective RCD protection. An RCD or safety switch is one of the greatest electrical safety improvements of the last 25 years. However, you may be surprised to learn that the life-saving devices are missing from more than a third of Australian homes and of those that do have them, the vast majority do not have them on all the necessary circuits. It’s important not to confuse RCDs and circuit breakers. Circuit breakers are designed to protect a circuit from overloading or short circuit while an RCD is designed to protect a person. Put simply an RCD is designed specifically to prevent electrocution. They shut off the electrical supply in a fraction of a second when a current leakage is detected, avoiding the potential for serious electric shock, burns or worse. 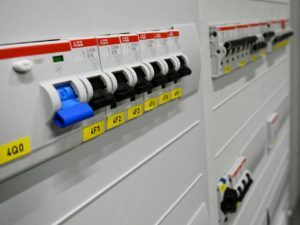 In fact, an RCD can disconnect the circuit within 300 milliseconds! Why Is RCD Protection So Important? According to Master Electricians Australia*, 15 people are killed every year in preventable accidents in Australian homes and a further 300 sustain serious electrical injuries or burns. You should therefore consider having an RCD installed on every circuit in your home including lights, power points, air conditioning, pool equipment, kitchen appliances and hot water. In Queensland there are a number of legal requirements in place to try and ensure homes are protected. Did you know, for example, that all rental or sale properties have to have safety switches installed on power point circuits? Further details of legal obligations can be found on the Electrical Safety Office website. What Types Of RCD Protection Are Available? In residential properties, switchboard safety switches can be found alongside circuit-breakers. Most electricians (and homeowners) prefer to combine circuit breakers with safety switch for lighting and power circuits in the same board. These are fitted to particular power points and are ideal for protecting appliances in areas such as bathrooms or workshops. These can be attached to extension leads, for example, to protect you when using portable appliances. Make sure you test your safety switches every month by pressing the test button. If it gets stuck it probably needs to be replaced. If you would like to get a quote to for safety switch installation on all the circuits in your home, give us a call today on 0414 751 299 or contact us via the website.